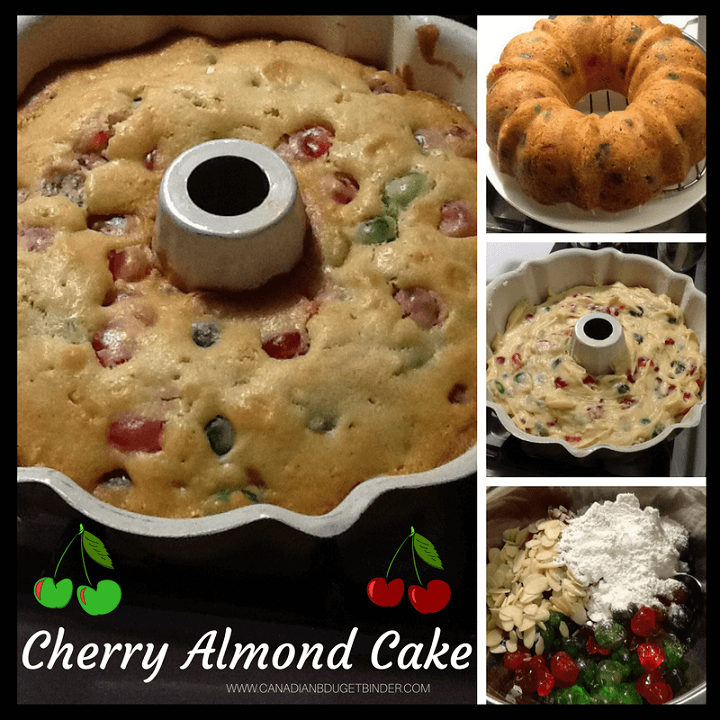 Cherry Almond Cake is a must-have fresh-baked cake in our household for the Christmas holidays. I, like lots of other people do quite a bit of home baking for Christmas but prefer to do more easy cakes and squares rather than cookies. Last week you might remember my Frosted Apple Cinnamon Rolls drenched in a silky glaze, perfect for Christmas morning with a cup of tea or coffee. 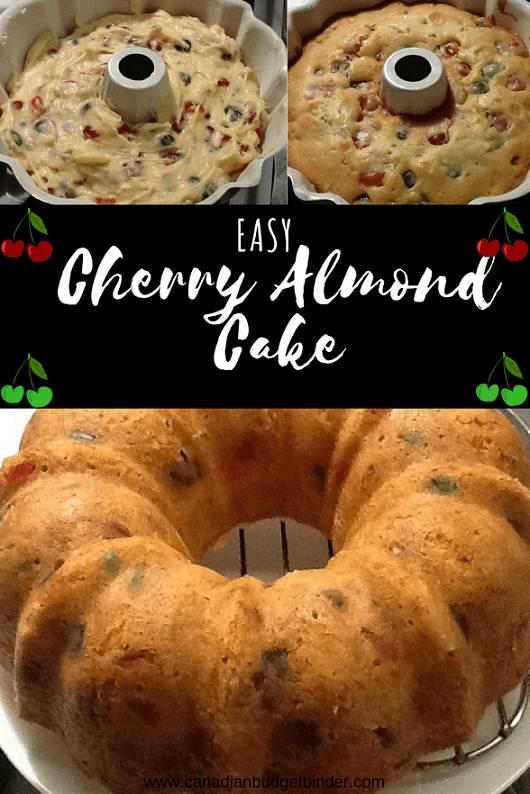 You can make that too but first let’s talk about this simple Cherry Almond Cake that even a novice baker can make. Each year around November I pull out my collection of traditional Christmas recipes to start preparing the ingredient shopping list. You’re always sure to save money on your grocery bill if you plan your Christmas baking needs ahead of time. Over the years I’ve collected recipes from just about any outlet that I can. Sometimes, I will take a recipe and add my twist to it which I think most people do. That’s the great thing about easy recipes or those that you can add or take away some of the star ingredients. This Cherry Almond Cake recipe came from one of those booklet hand-outs that companies offer in the mail or at the grocery store. You might be out of luck if you go looking for this Cherry Almond Cake recipe as it was found in a Robin Hood flour booklet in the 1980’s. I’m thrilled that I still have it but have tweaked it over the years to suit our family tastes. The hardest part about this Cherry Almond Cake recipe is keeping the rest of my family from eating it before Christmas. If you have sticky fingers in your house I’d suggest a lock and key for your freezer. This goes for just about any of the baked goods that I make for our holiday celebrations. Unless I make two of them, this Cherry Almond Cake is the first dessert that will get eaten at Christmas. On occasion I’ve made this Cherry Almond Cake throughout the year but generally I keep it for Christmas. I like when my family anticipates something that they only get once or twice a year. The original recipe said to use just the red candied cherries but I like having green cherries to make the cherry almond cake more festive. I can usually find both in the same container at our local bulk store for a reasonable price. If you shop at the Bulk Barn keep an eye out for their popular coupon, spend $10 save $3 to help cut costs. This cherry almond cake is comparable in texture to a pound cake, so it’s not as ‘light’ as most cakes but it’s still very good. With the mixture of green and red cherries the cherry almond cake is festive enough to be on a tray of Christmas goodies!!! If you don’t have a bundt pan to make your Cherry Almond Cake a regular tube pan works just as well. Just grease and add a light dusting of flour to the pan beforehand will help keep the cherry almond cake from sticking. One thing I always suggest before baking is to make sure you have all of your ingredients on the counter and portioned out. This will speed up the prep process and get your Cherry Almond Cake into the oven. Nothing says Christmas or festive holidays other than a Cherry Almond Cake. This cake has a texture similar to a pound cake so it's perfect any time of the day with a hot beverage. Add a frosting or glaze if you'd like after the cake cools. Mix these well in a bowl and set aside. Cream the butter, sugar, and extracts until light and fluffy in a mixer or large bowl. Add eggs one at a time and beating on high speed for one minute after each addition. Add to the creamed mixture alternating with the milk. Start and end with the dry ingredients. Stir in the floured fruit and almonds. Spread into the greased and floured bundt or tube pan. Bake at 300F for 60-70 minutes or until the cake tests done. Once it's cool, wrap in plastic or foil and store in a cool spot to allow the flavours to ripen. This amazing Cherry Almond Cake will keep uncut for a week or so easily if wrapped up well. Sorry I couldn’t slice a piece for you but my cake is safely waiting to be eaten for the holidays. I can assure you that you won’t be disappointed by the beauty, taste and texture of this baked good. I hope you enjoy this Cherry Almond Cake as much as we do here in our house over the Christmas holidays. If you wan to take this Cherry Almond Cake one step further you could make a lovely frosting or glaze to add over the top of the cake. P.S don’t forget to make 2 or 3 just in case your family gets hold of it before the holidays. It’s always a safe bet, I know from experience.